PM Narendra Modi is always known for working things in an exceptional way, something out of the ordinary. And once again he has expanded his campaign seeking the attention of the Bollywood celebrities. He posted a number of tweets asking the celebs to urge people to exercise their voting rights and vote in the upcoming Lok Sabha elections. He tagged people from various sections of the society, including politics, films, media, social work and sports. Mostly quoting dialogues from films, Modi reached out to Bollywood actors on the famous twitter handle. 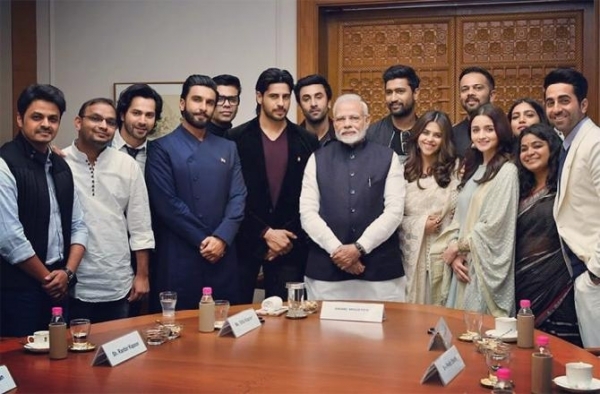 On twitter, Modi made an appeal to some renowned faces of Bollywood including Amitabh Bachchan,Karan Johar, Salman Khan, Shah Rukh Khan, Bhumi Pednekar, Akshay Kumar, AyushmannKhurrana and Aamir Khan to appeal to the youngsters to cast their vote. The step is seen as an exemplary one as India is a country highly influenced by Bollywood and such a step shall help in raising awareness amongst the masses about their voting rights. Akshay Kumar and Aamir Khan also tweeted promoting the idea. Quoting the famous comedy "Andaz Apna Apna", the PM wrote to Salman Khan saying, "Dear @BeingSalmanKhan and @aamir_khan, It is time to inspire and motivate youth in your own Andaz (style) to vote so that we can strengthen Apna (our) Democracy and andApna country." Writing to the female Bollywood fraternity he wrote "Requesting @deepikapadukone, @aliaa08 and @AnushkaSharma to urge people to vote in large numbers for the coming elections. As renowned film personalities whose work is admired by many, I am sure their message will have a positive impact on our citizens,"
Not just this he further tweets addressing Ranveer Singh, Vicky Kaushal and Varun Dhawan and said, "Many youngsters admire you. It is time to tell them: Apna Time Aa Gaya Hai and that it is time to turn up with high Josh to a voting centre near you." Sure this unique voting campaign will spread awareness amongst the masses and more people will come forward to vote in the upcoming elections. You Might Also Like: PM Narendra Modi accepts Fitness Challenge by Virat Kohli!